For other people named Robert Stephenson, see Robert Stephenson (disambiguation). For the Scottish designer and builder of lighthouses, see Robert Stevenson (civil engineer). Robert Stephenson FRS HFRSE DCL (16 October 1803 – 12 October 1859) was an early English railway and civil engineer. The only son of George Stephenson, the "Father of Railways", he built on the achievements of his father. Robert has been called the greatest engineer of the 19th century. Robert was born in Willington Quay, on the Northumberland coast, the son of George Stephenson and his wife, Frances Henderson. The family moved to Killingworth, where Robert was taught at the local village school. Robert attended the middle-class Percy Street Academy in Newcastle and at the age of fifteen was apprenticed to the mining engineer Nicholas Wood. He left before he had completed his three years to help his father survey the Stockton and Darlington Railway. Robert spent six months at Edinburgh University before working for three years as a mining engineer in Colombia. 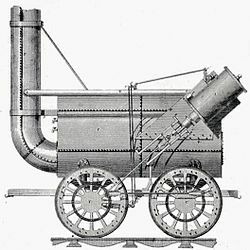 When he returned his father was building the Liverpool and Manchester Railway, and Robert developed the steam locomotive Rocket that won the Rainhill Trials in 1829. He was appointed chief engineer of the London and Birmingham Railway in 1833 with a salary of £1,500 per annum. By 1850 Robert had been involved in the construction of a third of the country's railway system. He designed the High Level Bridge and Royal Border Bridge on the East Coast Main Line. With Eaton Hodgkinson and William Fairbairn he developed wrought-iron tubular bridges, such as the Britannia Bridge in Wales, a design he would later use for the Victoria Bridge in Montreal, for many years the longest bridge in the world. He eventually worked on 160 commissions from 60 companies, building railways in other countries such as Belgium, Norway, Egypt and France. In 1829 Robert married Frances Sanderson who died in 1842; the couple had no children and he did not remarry. In 1847 he was elected Member of Parliament for Whitby, and held the seat until his death. Although Robert declined a British knighthood, he was decorated in Belgium with the Knight of the Order of Leopold, in France with the Knight of the Legion of Honour and in Norway with the Knight Grand Cross of the order of St. Olaf. He was elected a Fellow of the Royal Society (FRS) in 1849. He served as President of the Institution of Mechanical Engineers and Institution of Civil Engineers. Robert's death was widely mourned, and his funeral cortège was given permission by Queen Victoria to pass through Hyde Park, an honour previously reserved for royalty. He is buried in Westminster Abbey. Robert Stephenson was born on 16 October 1803,[note 1] at Willington Quay, east of Newcastle upon Tyne, to George Stephenson and Frances née Henderson, usually known as Fanny. She was twelve years older than George, and when they met was working as a servant where George was lodging. After marriage George and Fanny lived in an upper room of a cottage; George worked as a brakesman on the stationary winding engine on the Quay, and in his spare time cleaned and mended clocks and repaired shoes. Fanny was suffering from tuberculosis (known at the time as consumption), so George would take care of his son in the evening. Robert later recalled how he would sit on his father's left knee with his right arm wrapped around him while he watched him work or read books; his biographer Jeaffreson explained this is why Robert's left arm was the stronger. In autumn 1804 George became a brakesman at the West Moor Pit and the family moved to two rooms in a cottage at Killingworth. On 13 July 1805 Fanny gave birth to a daughter who lived for only three weeks, Fanny's health deteriorated and she died on 14 May 1806. George employed a housekeeper to look after his son and went away for three months to look after a Watt engine in Montrose, Scotland. He returned to find his housekeeper had married his brother Robert. [note 2] He moved back into the cottage with his son and briefly employed another housekeeper before his sister Eleanor moved in. Known to Robert as Aunt Nelly, Eleanor had been engaged to be married before travelling to London to work in domestic service. However, returning to get married Eleanor's ship was delayed by poor winds and she arrived to find her fiancé had already married. Eleanor attended the local Methodist church, whereas George would not regularly attend church, preferring on Sundays to work on engineering problems and meet his friends. Robert was first sent to a village school 1 1⁄2 miles (2.4 km) away in Long Benton, where he was taught by Thomas (Tommy) Rutter. On his way to school, he would carry picks to the smith's at Long Benton to be sharpened. George was promoted in 1812 to be enginewright at Killingworth Colliery with a salary of £100 per annum. He built his first steam locomotive, Blücher, in 1814 and the following year was earning £200 per annum. 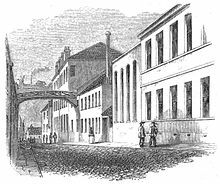 George had received little formal education but was determined that his son would have one, and so sent the eleven-year-old Robert to be taught by John Bruce at the Percy Street Academy in Newcastle. Most of the children came from middle-class families, and it was while he was at the academy that Robert lost most of his Northumberland accent. At first Robert walked the 10 miles (16 km), but was liable to catch a cold; George fearing tuberculosis bought him a donkey. Robert became a member of the Newcastle Literary and Philosophical Society and borrowed books for him and his father to read. In the evening he would work with George on designs for steam engines. In 1816 they made a sundial together, which is still in place above the cottage door. After leaving school in 1819, Robert was apprenticed to the mining engineer Nicholas Wood, who was viewer (manager) of Killingworth colliery. The following year Robert's Aunt Nelly married and George married Elizabeth Hindmarsh. George had courted Elizabeth before he had met Fanny, but the relationship had been put to an end by Elizabeth's father; Elizabeth had sworn at the time that she would not marry anyone else. [note 3] As an apprentice Robert worked hard and lived frugally, and unable to afford to buy a mining compass, he made one that he would later use to survey the High Level Bridge in Newcastle. Robert learnt to play the flute, which he played during services at the local parish church. Ways were investigated in the early 19th century to transport coal from the mines in the Bishop Auckland area to Darlington and the quay at Stockton-on-Tees, and canals had been proposed. The Welsh engineer George Overton suggested a tramway, surveyed a route in September 1818 and the scheme was promoted by Edward Pease at a meeting in November. [note 4] A private bill for a Stockton and Darlington Railway (S&DR) was presented to Parliament in 1819, but was opposed by landowners and did not pass. The route was changed, Overton carried out another survey and an Act received Royal Assent on 19 April 1821; Pease and George Stephenson met for the first time in Darlington that same day,[note 5] and by 23 July George had been appointed to make a fresh survey of the line. Robert had not completed his apprenticeship, but he was showing symptoms of tuberculosis and his work was hazardous; he was down West Moor Pit when there was an underground explosion. Wood agreed to release the 18-year-old Robert so that he could assist his father during the survey. By the end of 1821 they reported that a usable line could be built within the bounds of the Act, but another route would be shorter and avoid deep cuttings and tunnels. George was elected engineer by shareholders with a salary of £660 per annum. He advocated the use of steam locomotives, Pease visited Killingworth in the summer of 1822 and the directors visited Hetton colliery railway, on which George had also introduced locomotives. During the survey of the S&DR George had been persuaded, mainly by the Scottish engineer Robert Bald, that Robert would benefit from a university education. George could have afforded to send his son to a full degree course at Cambridge, but agreed to a short academic year as he wished that Robert should not become a gentleman, but should work for his living. Robert first helped William James to survey the route of the Liverpool and Manchester Railway, and then attended classes at Edinburgh University in Natural Philosophy, Natural History and Chemistry between October 1822 and April 1823. On 23 May 1823, a second S&DR Act received Assent with the Stephensons' deviations from the original route and permission for the use of "loco-motives or moveable engines". In June 1823 the Stephensons and Pease opened Robert Stephenson and Company at Forth Street in Newcastle to build these locomotives, Pease lending Robert £500 so he could buy his share. As George was busy supervising the building of the railway, Robert was placed in charge of the works with a salary of £200 per annum. Robert also surveyed the route and designed the Hagger Leases branch, which was planned to serve the collieries at Butterknowle and Copley Bent. A new Act was required for the line, and Robert stayed in London for five weeks while the bill passed through its parliamentary process, Assent being given in May 1824. The S&DR ordered two steam locomotives and two stationary engines from Robert Stephenson & Co. on 16 September 1824, and the railway opened on 27 September 1825. On 18 June 1824 Robert had set sail on the Sir William Congreve from Liverpool for Colombia with a contract for three years. The Colombian Mining Association had been formed to reopen gold and silver mines in South America and a Robert Stephenson & Co. partner, Thomas Richardson, was a promoter. Robert Stephenson & Co. received orders for steam engines from the company, and Richardson suggested to Robert that he go to South America, which he accepted. To prepare for the trip Robert took Spanish lessons, visited mines in Cornwall and consulted a doctor, who advised that such a change of climate would be beneficial to his health. Robert had arrived in Liverpool on 8 June, and George was with him from 12 June. In his 1984 biography of the Stephensons, L.T.C. Rolt takes issue with earlier writers' suggestions that the assignment was solely due to Robert's health. Questioning why Robert left the locomotive construction company and his other work, he suggests that there must have been a disagreement between the Stephensons over George's business dealings. Later biographers, Hunter Davies (1975) and David Ross (2010), argue that Robert was seeking to assert his independence from the control of his father. [note 6] Michael Longbridge, who had agreed to take over management of Robert Stephenson & Co. in Robert's absence, understood that it would be for only a year. After a five-week journey Robert arrived at the port of La Guayra in Venezuela on 23 July 1823. He investigated building a breakwater and pier at the harbour and a railway to Caracas. A railway linking Caracas to its port was an ambitious project as Caracas is situated at nearly 1000m above sea level: one was not completed until the 1880s. Robert had potential backers for his railway in London, but he concluded that while the cost of a pier, estimated at £6,000, would be sustainable, that of a breakwater or railway would not. He travelled overland with an interpreter and a servant to Bogotá, then the capital of Greater Colombia, arriving on 19 January 1825. Travelling onward, Robert found the heavier equipment at Honda on the Magdalena River; there was no way to get it to the mines as the only route was a narrow and steep path. 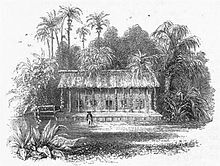 The mines were another 12 miles (19 km) from Mariquita, and Robert set up home at Santa Ana in a bungalow built from bamboo. The Mining Association sent Cornish miners to work the mine, but they proved difficult to manage and drank so heavily that only two-thirds were ever available for work on any given day. They refused to accept that Robert, who had not been brought up in Cornwall, could know anything about mining. One night Robert broke up a drunken party that was shouting they would not obey a bearded boy, saying that he would not fight them as he was sober. Robert felt that his reports to London were being ignored, as heavy equipment continued to be sent. He suffered from fevers, and once felt his "old complaint, a feeling of oppression in the breast." Robert's contract ended on 16 July 1827. He travelled to Cartagena to see if he could walk across the Panama Isthmus, but this proved too difficult. While waiting for a ship to New York, he met the railway pioneer Richard Trevithick,[note 7] who had been looking for South American gold and silver in the mines of Peru and Costa Rica, and gave him £50 so he could buy passage home. Robert caught a ship to New York; en route this picked up shipwrecked survivors that were so weak they had to be winched aboard, before the ship he was on sank in another storm. Everyone was saved, but Robert lost his money and luggage. He noticed that one second-class passenger was given priority over first-class passengers in the lifeboats: the captain later said privately that he and the passenger were Freemasons and had sworn an oath to show such preference to each other in times of peril. Robert was impressed and became a Freemason in New York. [note 8] Wishing to see something of North America, Robert with four other Englishmen walked the 500 miles (800 km) to Montreal via Niagara Falls. He returned to New York, caught the packet Pacific across the Atlantic and arrived in Liverpool at the end of November. George was living in Liverpool at the time, working as the chief engineer of the Liverpool and Manchester Railway (L&MR), and Robert stayed briefly as a guest at his father's house. Robert travelled to London to meet the directors of the Colombian Mining Association, and then started on the business of Robert Stephenson & Co. with a visit to Brussels. He spent Christmas in London, and was impressed with the tidiness of Gurney's steam carriages, before returning to Newcastle, where he was to spend the next five years. In 1827 George had built the Experiment with sloping cylinders instead of the vertical ones on previous locomotives built in Newcastle. Robert wanted to improve the way the wheels were driven and had a chance when an order arrived in January 1828 from the L&MR. The Lancashire Witch was built with inclined cylinders that allowed the axles to be sprung, but the L&MR withdrew the order in April; by mutual agreement the locomotive was sold to the Bolton and Leigh Railway. A number of similar locomotives with four or six wheels were built in the next two years, one being sent to the US for the Delaware and Hudson Canal Company. As well as working at the locomotive works, Robert was also surveying routes for railways and advised on a tunnel under the River Mersey. In March 1828 Robert wrote to a friend saying he had an attraction to Broad Street in London as Frances (Fanny) Sanderson lived there. [note 9] Robert and Fanny had known each other before he had gone to South America, and after calling on her soon after returning he had an invitation from her father to be a frequent visitor. He introduced her to his father in August 1828, and she accepted his proposal of marriage at the end of that year. Robert spent so much time in London the following year that his partners accused him of neglecting his business. Robert had not wished for a long engagement, but it took some time until a suitable house was found at 5 Greenfield Place in Newcastle, and Robert and Fanny married in London on 17 June 1829. The L&MR directors had not decided whether to use fixed engines with ropes or steam locomotives, and resolved on 20 April 1829 to hold trials to see if a steam locomotive would meet their requirements. On the last day of August the date was set to 1 October and the location to a two-mile (3.2 km) double-track railway that was to be built at Rainhill. Robert designed the locomotive for the trials during the summer of 1829. Only two of the wheels were driven, as experience had shown wrought-iron tyres had a high rate of wear that quickly resulted in wheels of different size, and gears were provided for both forward and reverse running . [note 10] The performance-enhancing idea to heat water using many small diameter tubes through the boiler was communicated to Robert via a letter from his father, George, who heard about it from Henry Booth and Marc Seguin . [note 11] With both George and Booth in Liverpool, Robert was responsible for the detail design, and he fitted twenty-five 3-inch (76 mm) diameter tubes from a separate firebox through the boiler. In September the locomotive was sent to Rainhill where it was coupled with its tender; when it was given the name Rocket is not known. The Rainhill Trials started on Tuesday, 6 October, and between 10,000 and 15,000 people had assembled to watch. Five locomotives had arrived, but Perseverance did not compete, having been damaged on the way to Rainhill, and Cyclops, powered by two horses in a frame, was not a serious entry. 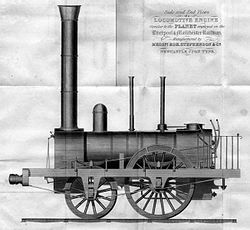 Challenging Rocket was Novelty, built by John Ericsson and John Braithwaite in London, and Sans Pareil, built at the Shildon railway works by Timothy Hackworth, the locomotive supervisor of the S&DR. None of the locomotives were ready on Wednesday. The following day at 10:30 am Rocket started its 70-mile (110 km) journey forwards and backwards across the 1½-mile (2.4-kilometre) course. It covered the first thirty-five miles in 3 hours and 12 minutes, the coke and water were replenished for fifteen minutes, and completed the course in another 2 hours 57 minutes. It had run at an average speed of 12 miles per hour (19 km/h), and the highest speed reached was over 29 miles per hour (47 km/h). Novelty still had to run, and was the favourite, although George is recorded as saying "Eh mon, we needn't fear yon thing, her's got nae goots"; she tried to run that Saturday but a steam pressurised joint rapidly failed. Sans Pareil was found to be overweight the following Tuesday, but allowed to run. She burnt fuel at more than three times the rate of Rocket before her boiler ran dry. Novelty was tried again the following day, was withdrawn after a joint failed again, and Rocket was declared the winner. The L&MR purchased Rocket and ordered four similar locomotives from Robert Stephenson & Co. before the end of October. Four more similar locomotives followed, before Planet was delivered on 4 October 1830 with cylinders placed horizontally under the boiler. Hackworth was building Globe at the Robert Stephenson & Co. works at the same time, and Edward Bury delivered Liverpool the same month, both with cylinders under the boiler. It has been alleged that Robert copied Hackworth or Bury; he later said he had no knowledge of Liverpool at the time he was designing Planet. 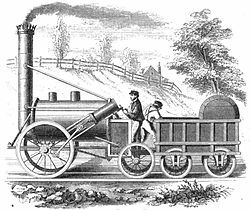 John Bull, a Planet type locomotive, was shipped to the US and became the first movement by steam on a railway in New Jersey when it ran on the Camden and Amboy Railroad in 1831. So many orders for locomotives were received that Robert proposed in 1831 to open a second locomotive works. It was agreed that the Stephenson name would not be attached to any other works, and what was to become the Vulcan Foundry was developed at Newton-le-Willows. There was still opposition to the use of steam locomotives, and before the L&MR opened George and directors hosted a number of private viewings. The actress Fanny Kemble, then famous for her recent portrayal of Juliet at Covent Garden, accompanied George for a trip on the footplate. The L&MR opened on 15 September 1830 with the Prime Minister the Duke of Wellington travelling in one of the inaugural trains. During a stop on the journey another passenger, a member of parliament, William Huskisson, stepped down from a carriage and was hit by Rocket passing on the other track. [note 12] Huskisson was taken by train to Eccles and died that evening. George Stephenson & Son had been created on the last day of 1824, when Robert was in South America, with the same partners as Robert Stephenson & Co. Formed to carry out railway surveys and construction, George and Robert were both listed as chief engineers and responsible for Parliamentary business, and the list of assistant engineers included Joseph Locke, John Dixon, Thomas Longridge Gooch and Thomas Storey. The company took on too much work that was delegated to inexperienced and underpaid men. Soon after he had returned from America Robert took over responsibility for overseeing the construction of the Canterbury & Whitstable Railway, and this opened on 3 May 1830 with a locomotive similar to Rocket, called Invicta, supplied by Robert Stephenson & Co. He was also responsible for two branches of the L&MR, the Bolton & Leigh and Warrington & Newton railways. The Leicester & Swannington Railway was built to take coal from the Long Lane colliery to Leicester, and Robert was appointed engineer. Robert Stephenson & Co. supplied Planet type locomotives, but these were found underpowered and were replaced in 1833. Robert thought that the coalfield could be developed further, and with two friends purchased an estate at Snibston when it came up at auction. George moved to Alton Grange in 1831 to supervise, and a seam of coal was found after digging through a layer of waterlogged mudstone over hard volcanic greenstone. George was to later say that Snibston colliery was his most profitable enterprise. The route of Grand Junction Railway authorised on 6 May 1833 had been surveyed by Locke. Although he had been instructed by George, Locke hoped to become chief engineer as his contract with Stephenson had expired. However, George threatened to withdraw support completely and the railway company divided the contract, with George and Locke becoming responsible for half of the route. Locke divided the work into small, well-defined contracts that had been all placed by September 1834. George, delegating the work to untrained assistants, drew up specifications and estimates that were vague or inaccurate and difficult to place. In August 1835 Locke took over supervision of the entire length of line and the Grand Junction Railway opened in 1837. On 18 September 1830 George Stephenson & Son signed a contract to survey the route for the London & Birmingham Railway. George recommended the route via Coventry, rather than an alternative via Oxford, but it was Robert that did most of the work; that same year Robert joined the Institution of Civil Engineers as a member. [note 13] There were two surveys in 1830–31, which met opposition from landed gentry and those who lived in market towns on the coach route that would be bypassed. Robert stood as the engineering authority when a bill was presented to Parliament in 1832 and it was suggested during cross-examination that he had allowed too steep an angle on the side of the cutting at Tring. Remembering that Thomas Telford had cut through similar ground at Dunstable, Robert left with Gooch in post-chaise that night, and arrived at the cutting at dawn to find it the same angle he had proposed. He returned and was in the company solicitor's office at 10 am. That year the bill passed through the Commons but was defeated in the Lords. After a public campaign and another survey by Robert, the necessary Act was obtained on 6 May 1833, and it was Robert, not yet 30 years old, that signed the contract on 20 September 1833 to build the 112-mile (180 km) railway from Camden Town to Birmingham. The incline and stationary steam engine chimneys at Camden Town. Robert was unable to order from Robert Stephenson & Co. due to railway company rules about conflict of interest, and so locomotives were purchased from seven other firms. Charles Wheatstone, Robert's friend, installed the first electric telegraph between Euston Square and Camden Town stations in autumn 1837. Trains started running between London and Birmingham on 24 June 1838, and the L&BR opened ceremonially on 15 September 1838. Construction had taken four years and three months, but had cost £5.5 million against the original estimate of £2.4 million. While living at Haverstock Hill, Robert would work six days a week, rising at 5 am, when he would study the sciences and read poetry; he was a firm Tory, but avoided reading political articles in newspapers. He was respected and known as "The Chief", but told a friend that he felt that his reputation would "break under me like an eggshell"; he smoked cigars and he used calomel, a form of mercury chloride; this was commonly mixed with opium. His friend and writer, Francis Roubiliac Conder, said that if Robert was needed on site somewhere he would catch the northbound coach, sometimes sitting on the outside seat without an overcoat on a winter's evening. He did not play his flute at this time. However, Robert would be at home on Sundays attending church and spending time with his wife. Robert and Fanny had no children, but were surrounded by family. Fanny was liked by Robert's friends who would visit, such as Bidder, Gooch, John Joseph Bramah, and the company's solicitor, Charles Parker. She was said to rule "her husband without ever seeming to do so"; to please her he successfully applied to the Herald's College for a coat of arms, paying for it in November 1838, but he never liked it, calling it a "silly picture" just before his death. In 1835 Robert travelled with his father to Belgium. George had been invited to advise King Leopold on the Belgian State Railway, and was decorated with the Order of Leopold; Robert returned with his father two years later to celebrate the opening of the railway between Brussels and Ghent. By agreement with the L&BR, Robert was not permitted to work on any other engineering project while the railway was being built, but he was permitted to act as consultant. Because of the demand for his services, Robert opened offices in Westminster, first in Duke Street, and in 1837 moved to Great George Street, first to No. ​35 1⁄2 and in 1844 he moved along the street to No. 24, next door to the Institution of Civil Engineers building; this became the headquarters for both father and son. After Robert had moved to London, William Hutchinson filled the gap with his design and technical skills at the locomotive works in Newcastle. Longbridge left in 1836 and was replaced by Edward Cooke, Fanny's uncle; Cooke and Robert were on first name terms and Cooke was someone Robert felt he could trust. The Stephenson valve gear was developed in 1842, although whoever at Newcastle first thought of it was disputed; Robert authorised the manufacture of a full size prototype on seeing a small model. The six-coupled Stephenson long-boiler locomotive design was developed into a successful freight locomotive, but was unsuitable for sustained high speeds. The Stanhope and Tyne Railroad Company (S&TR) had been formed on 20 April 1832 as a partnership to build a railway between the lime kilns at Lanehead Farmhouse and the coal mines at Consett in County Durham. The partners had decided to build a railway instead of upgrading the existing Pontop Waggonway, and commissioned Robert as surveyor and consulting engineer, and with Thomas Elliot Harrison as acting engineer, construction started at Stanhope in July 1832. Robert accepted five £100 shares in payment of his fee of £1,000, and the line opened in 1834. Instead of obtaining an Act of Parliament the company had agreed wayleaves with the land owners, requiring payment of rent. The company borrowed heavily and the debt grew to £440,000; by 1840 the lime kilns and the section from Stanhope to Carrhouse had closed and the remaining Stanhope to Annfield section was losing money. A creditor sent a bill to Robert that the railway company could not pay, and Robert found that as the S&TR was not a limited company, shareholders were liable for the debt. Fearing financial ruin Robert sought the advice of Parker, the insolvent railway company was dissolved on 5 February 1841 and a new limited company, the Pontop and South Shields Railway, was created on 23 May 1842 to take over the line, Robert contributing £20,000. The southern section from Stanhope to Carrhouse was sold to the Derwent Iron Company at Consett. The Great North of England Railway opened in 1841 to York with a railway connection at Darlington to London, and the Newcastle and Darlington Junction Railway (N&DJR) was formed to extend this line to Newcastle using five miles of the Pontop and South Shields Railway. George Hudson, a railway financier known as the "Railway King", was the chairman of the N&DJR, and Robert was appointed engineer. Some work still needed to be completed on the L&BR, and the North Midland Railway and lines from Ostend to Liege and Antwerp to Mons in Belgium required Robert's attention. In 1839 he visited France, Spain and Italy for three months to advise on railways, meeting the leading French railway engineer Paulin Talabot. When he returned he was in demand, travelling the country, giving evidence to Parliament and was often asked to arbitrate in disputes between railway companies and their contractors. "My dear Fanny died this morning at five o'clock. God grant that I might close my life as she has done, in true faith and in charity with all men. Her last moments were perfect calmness." Robert grew to dislike the house on Haverstock Hill after the death of his wife. He moved to Cambridge Square in Westminster to be nearer to London's gentlemen's clubs, but soon afterwards the house was damaged by fire and he lived in temporary accommodation for ten months. The Newcastle and Darlington Junction Railway opened on 18 June 1844. A special train left Euston at 5:03 am, and travelling via Rugby, Leicester, Derby, Chesterfield and Normanton, reached Gateshead, south of the River Tyne, at 2:24 pm. Festivities were held in the Newcastle Assembly Rooms, where George was introduced as the man who had "constructed the first locomotive that ever went by its own spontaneous movement along iron rails", although there were people present who should have known better. When George had built the Stockton & Darlington and Liverpool & Manchester he had placed the rails 4 ft 8 in (1,422 mm) apart, as this was the gauge of the railway at the Killingworth Colliery. [note 19] Isambard Kingdom Brunel, chief engineer to the Great Western Railway, had adopted the 7 ft (2,134 mm) or broad gauge, arguing that this would allow for higher speeds. [not in citation given] Railways built with the different gauges met for the first time at Gloucester in 1844, and although an inconvenience to passengers, this became a serious problem for goods, with delays and packages being lost at Gloucester. In 1845 a Royal Commission was appointed and of the forty-six witnesses that gave evidence, only Brunel and his colleagues at the Great Western supported the broad gauge. Comparisons between a Stephenson locomotive between York and Darlington and one built by Brunel between Paddington and Didcot showed the broad gauge locomotive to be superior, but the commissioners found in favour of a 4 ft 8 1⁄2 in (1,435 mm) gauge, due in part to the greater number of route miles that had already been laid. [note 20] Brunel also supported propelling trains using the atmospheric system. Robert sent assistants to the Dalkey Atmospheric Railway in Ireland to observe, but advised against its use as the failure of one pump would bring traffic to a stop. Robert's stepmother Elizabeth had died in 1845. That year George was returning ill from a trip to Spain and suffered an attack of pleurisy in the cabin of the packet bound for Southampton. He retired to Tapton House, near Chesterfield, and married his housekeeper early in 1848. Later that year he died on 12 August following a second attack of pleurisy, and was buried in Trinity churchyard, in Chesterfield. George had been the President of the newly formed Institution of Mechanical Engineers, and Robert took over that role until 1853. The original box section Britannia Bridge, circa 1852. The Britannia Bridge was built for the Chester & Holyhead Railway to cross the Menai Straits from Wales to the island of Anglesey. The bridge needed to be 1,511 feet (461 m) long, and the Admiralty insisted on a single span 100 feet (30 m) above the water. Problems during the launch of the wrought-iron steamship the Prince of Wales meant that she fell with her hull not supported for 110 feet (34 m), but was undamaged. Robert was inspired by this and with William Fairbairn and Eaton Hodgkinson designed a wrought-iron tubular bridge large enough for a train to pass through. [note 22] They experimented with models in 1845 and 1846, and decided to use similar design on the 400-foot (120 m) Conwy Bridge to gain experience. The first Conwy tube was floated into position in March 1848 and lifted the following month, allowing a single line railway to open on 1 May. The second tube was lifted into position that October; on these days Brunel was with Robert supporting his friend. The positioning of the first of the four tubes for the Britannia Bridge was carried out in June 1849, when both Brunel and Locke were with Robert, and this was lifted into position in October. The second tube was in lifted into place 7 January 1850, a single line was open to public traffic through these tubes 18 March 1850, and the second line was open 19 October. The route north of Newcastle to Edinburgh along the coast, via Morpeth and Berwick, had been recommended by George in 1838, and Hudson promoted this route for the Newcastle and Berwick Railway in 1843. The required Act, which, was given Royal Assent in 1845, included a high level road and rail bridge across the Tyne at Newcastle and the Royal Border Bridge across the Tweed at Berwick. The High Level Bridge is 1,372 feet (418 m) long and 146 feet (45 m) high and made from cast-iron bows held taut by horizontal wrought-iron strings. The first train crossed the Tyne on a temporary wooden structure in August 1848; the iron bridge was formally opened by Queen Victoria in September 1849, Robert having been elected a Fellow of the Royal Society in June. The bridge across the Tweed is a 28-arch stone viaduct, and was opened by the Queen on 29 August 1850. At the celebratory dinner Robert sat beside the Queen; he had just been offered a knighthood, but had declined. Robert had become a member of the Société d'Études du Canal de Suez in 1846, and the following year had accompanied Talabot and Alois Negrelli to look at the feasibility of a Suez canal. 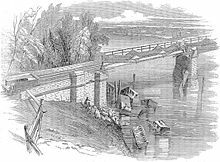 He advised against a canal, saying it would quickly fill up with sand, and assisted in the building of a railway between Alexandria and Cairo, with two tubular bridges that he had designed. This opened in 1854, and was extended to Suez in 1858. He spoke in Parliament against British involvement in a Suez canal scheme in 1857 and 1858. Robert had moved to 34 Gloucester Square in 1847; when in London he would socialise at the Athenaeum and Carlton clubs, delaying returning home until late. By 1850 Robert had been involved in a third of the country's railway system, and had prematurely aged and become ill with chronic nephritis, then known as Bright's Disease, a condition he had come to share with Isambard Brunel, for much the same reasons. Robert found that he attracted the unwelcome attention of inventors and promoters; if he was too ill to be at Great George Street they found him at home in Gloucester Square. In part to defend himself from these intrusions in 1850 he commissioned a 100-ton yacht, calling her Titania. Finding that he had no unwanted visitors when aboard, he referred to her as "the house that has no knocker"; when he went aboard, he seemed to grow younger and would behave like an excited schoolboy. He joined the Royal Yacht Squadron in 1850, becoming its first member not from an upper-class background. 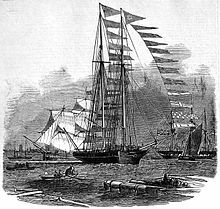 Titania missed the 1851 Royal Squadron Cup race, which America won and started the America's Cup challenge, but lost to America in a private race a few days later. A second yacht, also Titania but 90 feet (27 m) long and 184 tons, was built in 1852 after the first was destroyed by fire. In 1850 the route for the Norwegian Trunk Railway from Oslo (then Christiania) to Lake Mjøsa was surveyed, and Robert became chief engineer. Bidder stayed on as resident engineer, Robert returning in 1851, 1852 and 1854. In August 1852 Robert travelled to Canada to advise the Grand Trunk Railway on crossing the St Lawrence River at Montreal. The 8,600-foot (2,600 m) Victoria Bridge had a 6,500-foot-long (2,000-metre-long) tube made up of 25 wrought iron sections, and was to become for a time the longest bridge in the world. In 1855 Robert was decorated Knight of the Legion of Honour by the Emperor of France. Having served as vice-president of the Institution of Civil Engineers since 1847, he was elected president in 1856, and the following year received a Honorary Doctorate of Civil Law at Oxford along with Brunel and Dr Livingstone. During his life he had become close friends with Brunel and Locke, and in 1857, although weak and ill, he responded to a plea for help from Brunel in launching the SS Great Eastern. Robert fell from the slipway into riverside mud, but continued without an overcoat until the end of his visit. The following day he was confined to his bed for two weeks with bronchitis. In late 1858 Robert sailed with some friends to Alexandria,[note 24] where he stayed on board Titania or at Shepheard's Hotel in Cairo. He dined with his friend Brunel on Christmas Day before returning to London, arriving in February 1859. He was ill that summer, but sailed to Oslo in the company of George Parker Bidder to celebrate the opening of the Norwegian Trunk railway and to receive the Knight Grand Cross of the order of St. Olaf. He fell ill at the banquet on 3 September and returned to England on board Titania in the company of a doctor, but the journey took seven days after the yacht ran into a storm. As Robert landed in Suffolk, Brunel was already seriously ill following a stroke and died the following day. Robert rallied, but died on 12 October 1859. He was three years older than Brunel. Robert's death was deeply mourned throughout the country, especially since it happened just a few days after the death of Brunel. His funeral cortège was given permission by the Queen to pass through Hyde Park, an honour previously reserved for royalty. Two thousand tickets were issued, but 3000 men[note 25] were admitted to the service at Westminster Abbey, where he was buried beside the great civil engineer Thomas Telford. Ships on the Thames, Tyne, Wear and Tees placed their flags at half mast. Work stopped at midday on Tyneside, and the 1,500 employees of Robert Stephenson & Co. marched through the streets of Newcastle to their own memorial service. Robert left about £400,000:[note 26] the Newcastle locomotive works, Snibstone collieries and £50,000 went to his cousin George Robert Stephenson, the only son of George's younger brother Robert, £10,000 was left to Parker, Bidder and the Newcastle Infirmary, and the rest was left to friends or as legacies to institutions. One of the bequests, which was for £2,000, was to the fund from which the North of England Institute of Mining and Mechanical Engineers was anticipating the creation of its permanent Newcastle Headquarters. Robert was a member of this institute. The Victorian self-help advocate Samuel Smiles had published his first biography of George Stephenson in 1857, and although attacked as biased in the favour of George at the expense his rivals as well as his son, it was popular and 250,000 copies were sold by 1904. The Band of Hope were selling biographies of George in 1859 at a penny a sheet, and at one point there was a suggestion to move George's body to Westminster Abbey. The centenary of George's birth was celebrated in 1881 at Crystal Palace by 15,000 people, and it was George who was featured on the reverse of the Series E five pound note issued by the Bank of England between 1990 and 2003. The Stephenson Railway Museum in North Shields is named after George and Robert Stephenson. ^ Robert and George both gave the month of Robert's birth variously as October, November or December. Jeaffreson & Pole (1864a, p. 7) states that although he celebrated his birthday on 16 November, the October date was determined by looking at an extract from the register. Most biographies, such as Rolt (1984, p. 10) and Davis (1975, p. 8), give this date of birth except Ross (2010, pp. 21, 288), who gives the November date because George Parker Bidder was invited by Robert to a birthday party on 16 November 1852, and Robert's birthday is noted in Bidder's diary in 1853, 1854 and 1875. ^ George's younger brother Robert laid out the Bolton and Leigh Railway and the narrow gauge Nantlle Railway in Wales and was in charge of one of the locomotives on the opening day of the Liverpool and Manchester Railway, before coming manager of Pendleton Colliery. His only son, George Robert Stephenson, inherited the Robert Stephenson & Co. works after Robert's death. ^ Smiles had this story of Elizabeth and George meeting in an early edition, but removed it in later editions after being told by Elizabeth's brother that he had introduced the couple to each other in 1818 or 1819. However, subsequent biographers, such as Jeaffreson & Pole (1864a, p. 49) and Rolt (1984, p. 17) repeat the earlier account. ^ Pease was a Quaker and after approximately a third of the shares were bought by Quakers and Pease, his family and other local Quakers had control of the managing committee the railway became known as "the Quaker line". ^ When George was commissioned to survey the Liverpool and Manchester Railway, William James was left without a job, and was eventually bankrupt. Rolt argues that Robert's sympathies were with James, using a letter from Robert Stephenson to James as evidence, but after Rolt wrote his book this letter was re-attributed to George's brother, Robert. Davis quotes a letter from Robert to Longbridge, sent before George had got the L&MR contract, in which Robert is excited about going to Colombia. ^ In a contemporary account of the meeting, Trevithick claimed to have sat talking to George with an infant Robert on his knee many years before. However Davis (1975, pp. 158–159) and Ross (2010, pp. 94–95) both consider it unlikely that the Cornish Trevithick had met the Stephensons in Newcastle. ^ Ross (2010, pp. 164, 297) notes that Robert was not seen at any meetings and did not join an English lodge, and considers the membership as a form of insurance. ^ Fanny (1803–1842) was the daughter of John Sanderson of London. A relative has been quoted as saying that Fanny was intelligent and able to influence people without them knowing, and not beautiful, but had expressive dark eyes. ^ Marc Seguin, engineer to the St Etienne and Lyon Railway, had the idea at about the same time, and had a French patent. He built such a boiler that summer and fitted it to a locomotive two months after the Rainhill Trials. Although Seguin had visited the S&DR and ordered locomotives from Robert Stephenson & Co, the Booth-Stephenson design was different, and Seguin and the Stephensons had not discussed the idea. ^ The L&MR was built with the tracks 4 feet 8 1⁄2 inches (1.435 m) apart, although later the distance was increased to 6 feet (1.8 m). ^ In 1830 a civil engineer was any engineer not in military service. ^ This increased to £2,000 to match the salary Isambard Kingdom Brunel was awarded when he became chief engineer of the Great Western Railway. ^ After gaining the contract for the Great Western Railway, Brunel borrowed copies of Robert's drawings and modelled his system of draughting on that used by Robert. ^ Locomotives were used after July 1844 and the stationary engines were moved to a silver mine in Russia. ^ Later, British locomotive manufacturers were absent when the builders of the line through the Semmering Pass in Austria held trials in 1851 to select a locomotive that could haul 140 long tons (142 t; 157 short tons) up a 1 in 40 gradient. The competition was won by Bavaria, built in Munich with eight coupled wheels. ^ In 1857 Robert became godfather to Robert Stephenson Smyth Baden-Powell, and Ross (2010, p. 305) notes that Addeyman, John; Haworth, Victoria (2005), Robert Stephenson: Railway Engineer, North East Railway Association, p. 150, ISBN 1-873513-60-7 repeats the rumour that the child resulted from a long-term affair between Robert and Henrietta Baden-Powell, but there is no evidence for this other than gossip. Both Robert Stephenson and Rev. Prof. Baden Powell were FRS, and they were almost exact contemporaries. It was / is not unusual for a friend to be godfather, and the child named after him. ^ Smiles (1868, p. 234) states that early tramroads had rails 4 ft 8 in apart, but Tomlinson (1915, pp. 82–83) challenges this, stating that the most common gauge of the early tramroads and waggonways was of the order of 4 ft (1,219 mm), and some, such as the Wylam waggonway, had the rails 5 ft (1,524 mm) apart. ^ Early documents gave 4 ft 8 in as the gauge on both the S&DR and L&MR, but the distance between the rails was later measured as 4 ft 8 1⁄2 in, and this became the standard gauge used by 60 per cent of railways worldwide. The difference of 1⁄2 inch (13 mm) is a mystery. ^ For more details see Lewis, Peter (2007), Disaster on the Dee: Robert Stephenson's Nemesis of 1847, History Press, ISBN 978-0-7524-4266-2 . ^ Fairbairn claimed credit for the design in his book Fairbairn, William (1849), An account of the construction of the Britannia and Conway tubular bridges , to which Robert responded with Clark, Edwin; Stephenson, Robert (1849), General description of the Britannia and Conway tubular bridges on the Chester & Holyhead Railway . ^ Although Rolt (1984, p. 325) states that Robert supported the radicals, Ross (2010, p. 266) states he voted with the government, and he was included in the list of noes published in The Times the day after the vote. ^ For details of this journey see Bidder, Elizabeth (2012), The Elizabeth Bidder Diary, Robert Stephenson Trust . ^ It was reported in The Morning Post that "Great disappointment was felt at the entire exclusion of ladies", but that space was limited. ^ Sources differ as whether the legacy was valued over or under £400,000. ^ a b c "Fellows of the Royal Society". London: Royal Society. Archived from the original on 16 March 2015. ^ Davis 1975, Title of book. ^ "Robert Stephenson". Westminster Abbey. Retrieved 19 March 2014. ^ a b Bailey, Michael R., ed. (2003). 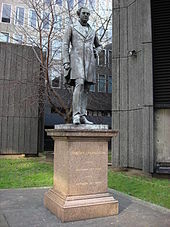 Robert Stephenson; The Eminent Engineer. Ashgate. p. XXIII. ISBN 0-7546-3679-8. ^ Rolt 1984, p. 10. ^ Rolt 1984, pp. 9–10. ^ Jeaffreson & Pole 1864a, pp. 8–9. ^ Rolt 1984, p. 11. ^ Jeaffreson & Pole 1864a, p. 13. ^ Rolt 1984, pp. xix, 12, 197, 201. ^ Rolt 1984, pp. 11–12. ^ Jeaffreson & Pole 1864a, pp. 15–17. ^ Jeaffreson & Pole 1864a, pp. 18, 22–23. ^ Rolt 1984, pp. 15–16. ^ Jeaffreson & Pole 1864a, pp. 19–17, 29. ^ Smiles 1868, pp. 165–166. ^ Jeaffreson & Pole 1864a, pp. 30, 33–34. ^ Rolt 1984, pp. 16–17. ^ Davis 1975, p. 14. ^ Jeaffreson & Pole 1864a, pp. 35–36. ^ a b c Kirby, M.W. (2004). "Stephenson, Robert". The Oxford Dictionary of National Biography. doi:10.1093/ref:odnb/26400. ^ Jeaffreson & Pole 1864a, pp. 42–44. ^ Jeaffreson & Pole 1864a, p. 46. ^ Rolt 1984, pp. 8–9, 17. ^ Ross 2010, p. 54. ^ Jeaffreson & Pole 1864a, pp. 47–49. ^ Jeaffreson & Pole 1864a, p. 50. ^ Allen 1974, pp. 15–16. ^ Tomlinson 1915, p. 53. ^ Kirby, Maurice W. (4 July 2002). The Origins of Railway Enterprise: The Stockton and Darlington Railway 1821–1863. Cambridge University Press. pp. 33, 37. ISBN 978-0-521-89280-3. ^ Allen 1974, p. 17. ^ Rolt 1984, pp. 64–65. ^ Davis 1975, pp. 62–65. ^ Tomlinson 1915, p. 74. ^ Rolt 1984, p. 69. ^ Jeaffreson & Pole 1864a, pp. 53–54. ^ Allen 1974, p. 20. ^ Tomlinson 1915, pp. 79–80. ^ Allen 1974, p. 19. ^ Rolt 1984, p. 77. ^ Tomlinson 1915, p. 83. ^ Rolt 1984, pp. 90–92. ^ Ross 2010, pp. 58–60. ^ Tomlinson 1915, pp. 85–86. ^ Tomlinson 1915, pp. 86–87. ^ Rolt 1984, pp. 80–81. ^ Allen 1974, p. 24. ^ Rolt 1984, pp. 101–102. ^ a b Rolt 1984, p. 102. ^ Jeaffreson & Pole 1864a, pp. 66–68. ^ Jeaffreson & Pole 1864a, pp. 69, 72. ^ Smiles 1868, pp. 301–302. ^ Jeaffreson & Pole 1864a, pp. 74–75. ^ Rolt 1984, pp. 95–96. ^ Davis 1975, pp. 103, 112–113. ^ Ross 2010, pp. 66–69. ^ Davis 1975, pp. 100–101. ^ Davis 1975, pp. 102, 322–323. ^ Davis 1975, pp. 111–112. ^ Rolt 1984, pp. 119–120. ^ Rolt 1984, pp. 120–121. ^ Rolt 1984, pp. 120–123. ^ Ross 2010, pp. 83–84. ^ Rolt 1984, pp. 123–124. ^ Smiles 1868, pp. 305, 307. ^ Ross 2010, pp. 93–94. ^ Rolt 1984, pp. 124–126. ^ Smiles 1868, pp. 108–109. ^ Rolt 1984, pp. 126–127. ^ Jeaffreson & Pole 1864a, pp. 112–113. ^ Jeaffreson & Pole 1864a, pp. 114–115. ^ Rolt 1984, p. 188. ^ Rolt 1984, pp. 131, 148. ^ Rolt 1984, pp. 148–149. ^ Jeaffreson & Pole 1864a, pp. 130–131. ^ Ross 2010, pp. 106–107. ^ Jeaffreson & Pole 1864a, pp. 132–134, 137. ^ Smiles 1868, p. 353. ^ Rolt 1984, p. 206. ^ Rolt 1984, pp. 158–159. ^ Rolt 1984, p. 160. ^ a b Rolt 1984, pp. 162–165. ^ Rolt 1984, pp. 135–136. ^ Jeaffreson & Pole 1864a, pp. 126–128. ^ Rolt 1984, p. 162. ^ Ross 2010, pp. 101–102. ^ Ross 2010, pp. 107, 294. ^ Jeaffreson & Pole 1864a, pp. 141–143. ^ Rolt 1984, pp. 166–171. ^ Rolt 1984, pp. 171–173. ^ Rolt 1984, p. 176. ^ Rolt 1984, pp. 180–184. ^ Watkins, J. Elfreath (1891). Camden and Amboy Railroad: Origin and early History (PDF). Gedney & Roberts. pp. 3, 33–34. Archived from the original (PDF) on 8 March 2014. ^ Rolt 1984, p. 187. ^ Ross 2010, p. 127. ^ Rolt 1984, pp. 188–192. ^ Davis 1975, p. 201. ^ Rolt 1984, pp. 196–199. ^ Rolt 1984, pp. 103–105. ^ Rolt 1984, pp. 211–212. ^ Rolt 1984, pp. 205–206. ^ Rolt 1984, p. 207. ^ Rolt 1984, pp. 208–210. ^ Jeaffreson & Pole 1864a, p. 164. ^ Rolt 1984, pp. 212–215. ^ Rolt 1984, p. 215. ^ Jeaffreson & Pole 1864a, pp. 166–167. ^ Jeaffreson & Pole 1864a, p. 165. ^ Ross 2010, p. 121. ^ Jeaffreson & Pole 1864a, pp. 169–172. ^ Jeaffreson & Pole 1864a, pp. 166–167, 172. ^ Jeaffreson & Pole 1864a, pp. 177–178. ^ Jeaffreson & Pole 1864a, pp. 179–180, 185. ^ Acts relating to the London and Birmingham Railway. George Eyre and Andrew Spottiswoode. 1839. p. 1. ^ Rolt 1984, pp. 223–224. ^ Jeaffreson & Pole 1864a, p. 188. ^ Jeaffreson & Pole 1864a, p. 186. ^ Jeaffreson & Pole 1864a, pp. 185–187. ^ Jeaffreson & Pole 1864a, pp. 188–192. ^ Jeaffreson & Pole 1864a, p. 213. ^ Jeaffreson & Pole 1864a, pp. 193–203. ^ Jeaffreson & Pole 1864a, pp. 206–208. ^ Conder 1868, p. 32. ^ Jeaffreson & Pole 1864a, p. 206. ^ Lecount 1839, p. 48. ^ Jeaffreson & Pole 1864a, pp. 235–236. ^ Rolt 1984, pp. 245, 247. ^ Jeaffreson & Pole 1864a, p. 209. ^ a b Jeaffreson & Pole 1864a, pp. 232–233, 243. ^ Ross 2010, p. 140. ^ Conder 1868, pp. 22–23. ^ a b Ross 2010, pp. 242–243. ^ Rolt 1984, pp. 231–232. ^ Ross 2010, p. 141. ^ Jeaffreson & Pole 1864a, p. 237. ^ Rolt 1984, pp. 255–257. ^ Ross 2010, pp. 148, 177. ^ Rolt 1984, pp. 257–259. ^ Rolt 1984, p. 293. ^ Allen 1974, pp. 42–43. ^ Hoole, K. (1974). A Regional History of the Railways of Great Britain: Volume IV The North East. David & Charles. pp. 188–189. ISBN 0715364391. ^ Rolt 1984, p. 263. ^ Rolt 1984, pp. 265–266. ^ Allen 1974, p. 75. ^ "Stanhope and Tyne Railroad Company (RAIL 663)". The National Archives. ^ Jeaffreson & Pole 1864a, pp. 246–250. ^ Jeaffreson & Pole 1864a, p. 261. ^ Allen 1974, pp. 61, 69, 71, 89. ^ Jeaffreson & Pole 1864a, pp. 238–241. ^ Jeaffreson & Pole 1864a, p. 255. ^ Ross 2010, pp. 251–252. ^ Ross 2010, p. 149. ^ Jeaffreson & Pole 1864a, pp. 253–255. ^ Ross 2010, p. 274. ^ Ross 2010, p. 272. ^ Ross 2010, p. 305. ^ Jeaffreson & Pole 1864a, pp. 259–260. ^ Rolt 1984, pp. 275–276. ^ Jeaffreson & Pole 1864a, pp. 257–258. ^ Allen 1974, p. 76. ^ Rolt 1984, pp. 280–281. ^ Jeaffreson & Pole 1864b, pp. 9–11, 17–19. ^ Rolt 1984, pp. 293–294. ^ Jeaffreson & Pole 1864b, pp. 27–28. ^ Davis 1975, p. 75. ^ "Robert Stephenson (1803–1859)". Network Rail. Retrieved 25 March 2014. ^ Rolt 1984, pp. 282–283. ^ Rolt 1984, pp. 288, 295–298. ^ Rolt 1984, pp. 299–300. ^ Rolt 1984, pp. 301–304. ^ Conder 1868, pp. 286–292. ^ Jeaffreson & Pole 1864b, p. 37. ^ Jeaffreson & Pole 1864b, pp. 81, 101. ^ Ross 2010, pp. 235–256. ^ Jeaffreson & Pole 1864b, pp. 82, 84–89. ^ Rolt 1984, p. 305. ^ Rolt 1984, p. 307. ^ Rolt 1984, pp. 309–313. ^ Rolt 1984, pp. 277–278. ^ Rolt 1984, pp. 283–286. ^ "Fellows". The Royal Society. (See complete listing for Robert's election as Fellow). Retrieved 29 April 2014. ^ Jeaffreson & Pole 1864b, pp. 144–145. ^ Rolt 1984, pp. 324–326. ^ Ross 2010, p. 247. ^ Ross 2010, p. 266. ^ a b "The Army Before Sebastopol". The Times (21965). 31 January 1855. p. 8. ^ a b Rolt 1984, pp. 326–327. ^ Wilson 1939, pp. 9–10. ^ Wilson 1939, p. 11. ^ Rolt 1984, p. 315. ^ Rolt 1984, pp. 318–319. ^ a b Rolt 1984, pp. 328–329. ^ Ross 2010, pp. 237–238. ^ Ross 2010, pp. 253–254. ^ Rolt 1984, p. 324. ^ "Norwegian Grand Trunk Railway". Illustrated London News. 7 October 1854. pp. 336–338. ^ Rolt 1984, pp. 315–316. ^ Smiles 1868, p. 485. ^ a b c d Davis 1975, p. 287. ^ Rolt 1984, p. 319. ^ Rolt 1984, p. 323. ^ Rolt 1984, pp. 256, 331–333. ^ "Funeral of Robert Stephenson in Westminster". The Morning Post. London. 22 October 1859. ^ Rolt 1984, p. 333. ^ a b Jeaffreson & Pole 1864b, p. 253. ^ Davis 1975, pp. 288–290. ^ Rolt 1984, p. ix. ^ Jones, Robin, ed. (2013). The Rocket Men: George and Robert Stephenson. Morton's Media. p. 23. ISBN 978-1-909128-27-9. ^ Davis 1975, p. 295. ^ "Notes recently withdrawn from circulation". Bank of England. Retrieved 24 December 2013. ^ "Join the railway revolution (about us)". Stephenson Railway Museum. 2014. Retrieved 20 March 2014. Allen, Cecil J. (1974) . The North Eastern Railway. Ian Allan. ISBN 0-7110-0495-1. Conder, F.R. (1868). Personal Recollections of English Engineers and of the Introduction of the Railway System in the United Kingdom. Hodder & Stoughton. OCLC 251964171. Davies, Hunter (1975). George Stephenson: A Biographical Study of the Father of Railways. Weidenfeld and Nicolson. ISBN 0297769340. Jeaffreson, J.C.; Pole, William (1864a). The Life of Robert Stephenson FRS Vol. 1. Longman, Green, Longman, Roberts and Green. OCLC 794212771. Jeaffreson, J.C.; Pole, William (1864b). The Life of Robert Stephenson FRS Vol. 2. Longman, Green, Longman, Roberts and Green. OCLC 794212775. Rolt, L.T.C. (1984). George and Robert Stephenson: The Railway Revolution. Penguin. ISBN 0-14-007646-8. Ross, David (2010). George and Robert Stephenson: A Passion for Success. History Press. ISBN 978-0-7524-5277-7. Smiles, Samuel (1868). The Life of George Stephenson and of his Son Robert Stephenson. Harper & Brothers. OCLC 1559045. Tomlinson, William Weaver (1915). The North Eastern Railway: Its Rise and Development. Andrew Reid and Company. OCLC 504251788. Wilson, Arnold T (1939). The Suez Canal: Its Past, Present, and Future (PDF). Oxford University Press. OCLC 1981248. Addeyman, John; Haworth, Victoria (2005). Robert Stephenson: Railway Engineer. North East Railway Association. ISBN 1-873513-60-7. Bailey, Michael R., ed. (2003). Robert Stephenson; The Eminent Engineer. Ashgate. ISBN 0-7546-3679-8. Wikimedia Commons has media related to Robert Stephenson.